This winter, your outfit won't be complete without the Fishers Finery Classic 100% Pure Cashmere Scarffrom the Newport Collection! Keep yourself warm during the cold winter season with this beautifully woven cashmere scarf. 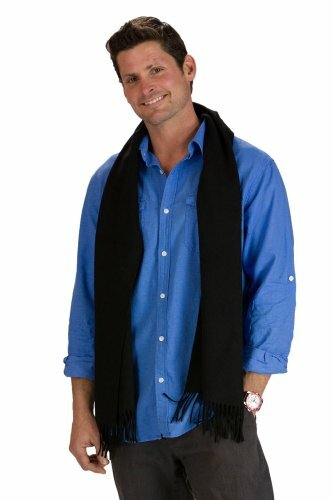 This scarf is made with 100% pure cashmere wool to keep you protected from the harsh winter breeze. It measures 65" x 12". This woven cashmere fabric is lightweight and soft, designed to be part of a comfortable and fashionable outfit. It is made with exceptional, durable quality that will keep you warm and cozy. Unlike other scarves, this classic scarf is pill-resistant and can withstand the harshness that cold weather brings. Use it anytime, anywhere and enjoy being outdoors without worrying about the weather! You can also wear this scarf in various ways! Tie it up on your neck as a French knot or a double-sided twist, use it as a cozy neck wrap, or just drape it over your shoulders as a simple scarf wrap or knotted shawl. Give this scarf as a present to your family, friends, coworkers or neighbors this holiday season. HIGH QUALITY FASHION: This scarf is made with 100% pure cashmere wool. Our cashmere is made from grade A, de-haired, 2 ply yarn. Our designer's desire to discover the most luxurious, supple fabric available makes this scarf ideal for winter weather. Pilling is a surface defect on fabrics that is caused by normal wear. Unlike other scarves on the market, this Fisher's Finery scarf is pill-resistant, making it great for everyday use even in the harshest of weather conditions. LUXURIOUS AND SIMPLE DESIGN: The best things in life are simple. That is the motto we modeled this scarf after. With this simple design, we let the fabric, color and print do the talking. This scarf measures 65" x 12". We have added a classic fringe detail to each end for a bit of texture and fun. VARIETY OF COLORS AND PRINTS: We offer a range of hand-picked colors to choose from: Black, Gray, Navy, Royal Blue, Cardinal Red, Stone, Cabernet, Smoke and Herringbone print. EASY CARE INSTRUCTIONS: We recommend dry cleaning or washing by hand as the best care methods. Although, dry cleaning is highly recommended, washing by hand will actually make cashmere softer over time. Use room temperature (cool) water and turn inside out. Use a baby shampoo or mild detergent and soak for 2 hours. Lay flat to dry. If you have any questions about this product by Fishers Finery, contact us by completing and submitting the form below. If you are looking for a specif part number, please include it with your message.